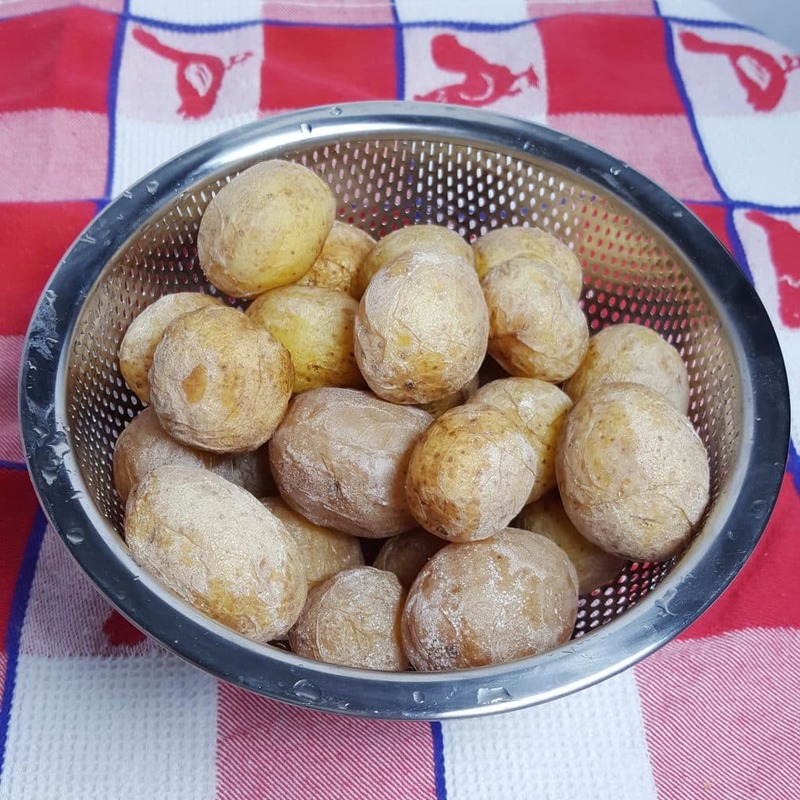 Instant Pot Salt Potatoes [Syracuse, New York], created by Irish Salt Miners are made with new potatoes boiled in brine, yielding a creamy interior. Created by local Irish Salt Mine Workers back in the 1800’s for a quick and cheap lunch. Traditionally, Syracuse Salt Potatoes are made with new, potatoes. Syracuse is in Central New York. The Irish Salt Workers would bring a bag of small potatoes to work and boil them in the Salt Springs. They did not peel them and they were often not premium potatoes. With the use of an Instant Pot, Mealthy MultiPot or Pressure Cooker, you can have the same great taste! Also, called, Canarian Wrinkly Potatoes, in the Canary Islands and served with a Red or Green Mojo. Salt – The Salt can be Sea Salt or Kosher Salt. As you can see, there are not many ingredients. The Potatoes should be new and white. And bite-sized, small enough to pop the whole Potato in your mouth. For a really good “Baked” Potato, make your large Russet Potatoes using this method. Unlike the Salt Miners, who boiled their potatoes in the Salt Springs, we’ll use a Pressure Cooker and enjoy the Potatoes in under 30 minutes. Fine Salt is best to use, as it will quickly melt. 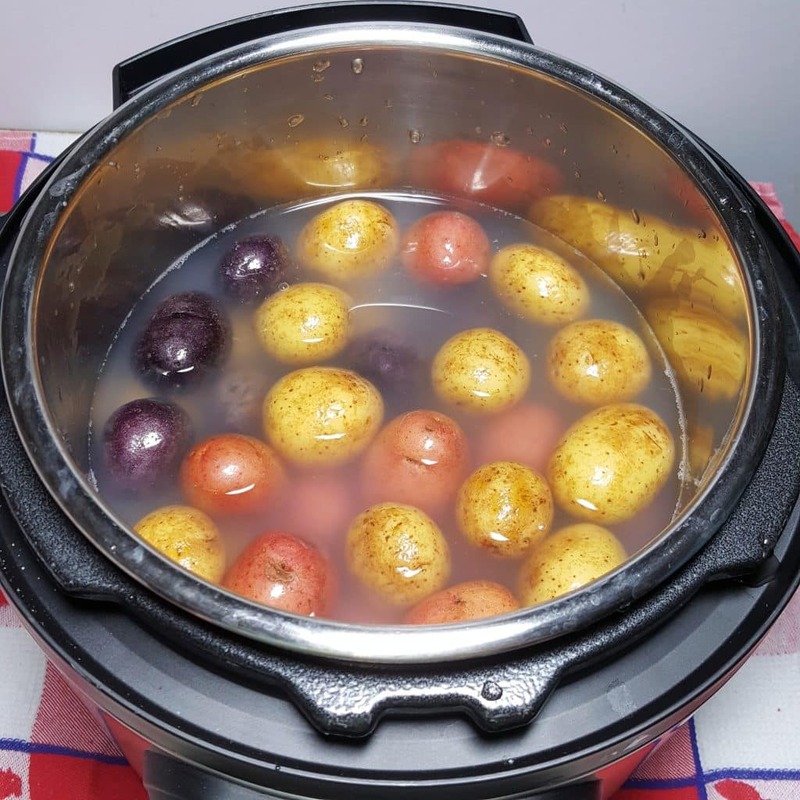 Instant Pot Salt Potatoes is easily altered for smaller portions. Follow the Salt/Water ratio found in the Recipe Card below, if you would like a larger portion. If you have a Mini Instant Pot, just cut the recipe completely in half. Cook time is the same and it works equally as well! Water + Salt = Salt Spring! What Type of Salt is Use in Instant Pot Salt Potatoes? Some people use Kosher Salt. It works too, just takes longer to dissolve. Pink Himalayan Salt is very tasty too. As a huge Potato lover, we eat this with our meals, quite often. The Salty residue protects the potatoes from becoming water-logged. Lukewarm Water + Salt = Salt Spring! Hahaha, just kidding. But, it does make a nice Brine. 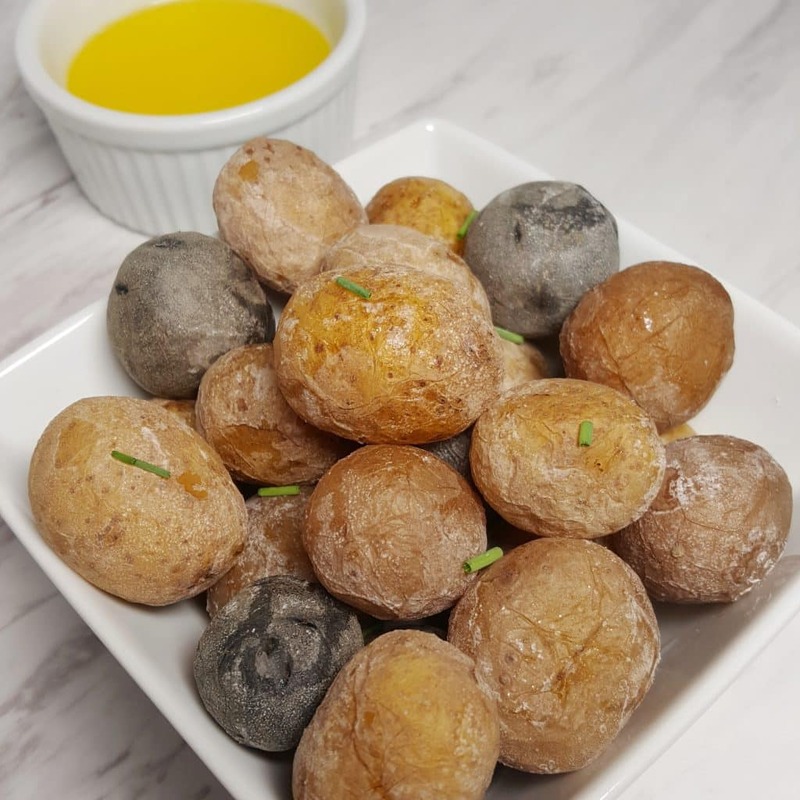 How to Make Instant Pot Salt Potatoes. Whisk up the salt with the water very, very well. The salt and water mix up very thick, like the Dead Sea. You won’t want to taste, as you will want to gag. Small potatoes are added and then cooked under pressure. I wonder if you can float in it like the Dead Sea. I went to the High School in Israel. We floated in the Dead Sea. It was salty! 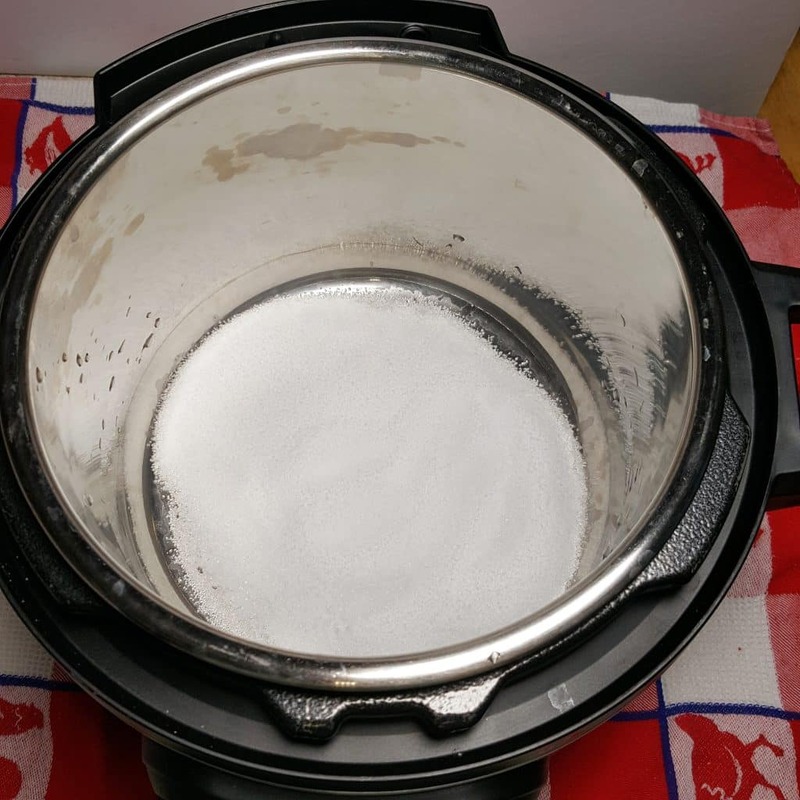 The end result of Instant Pot Salt Potatoes will not be overly salty, as the salt forms a crust. New York Coffee Shop Home Fries. Instant Pot Dirty Water Hot Dogs – like find in the City! 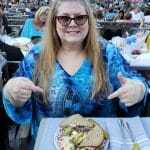 I love New York and the food. Can you tell? Three pounds of Potatoes fit nicely in a standard 6 quart Instant Pot, Mealthy MultiPot or Pressure Cooker. The Potatoes should be bite sized. If you cannot find the New/Small White Potatoes, grab some Fingerlings. If you can’t find either, but really want to make Instant Pot Salt Potatoes, buy the smallest Potatoes you can find and adjust the cook time. You can add more Potatoes if you like, just adjust the Salt and the Water. As I mentioned above, Traditional Syracuse Salt Potatoes use small white Potatoes. The shape doesn’t matter. As long as they are all similar size. Tri-color potatoes work very well too and after making a batch of the tri-colored, I can honestly say they are equally as delicious. 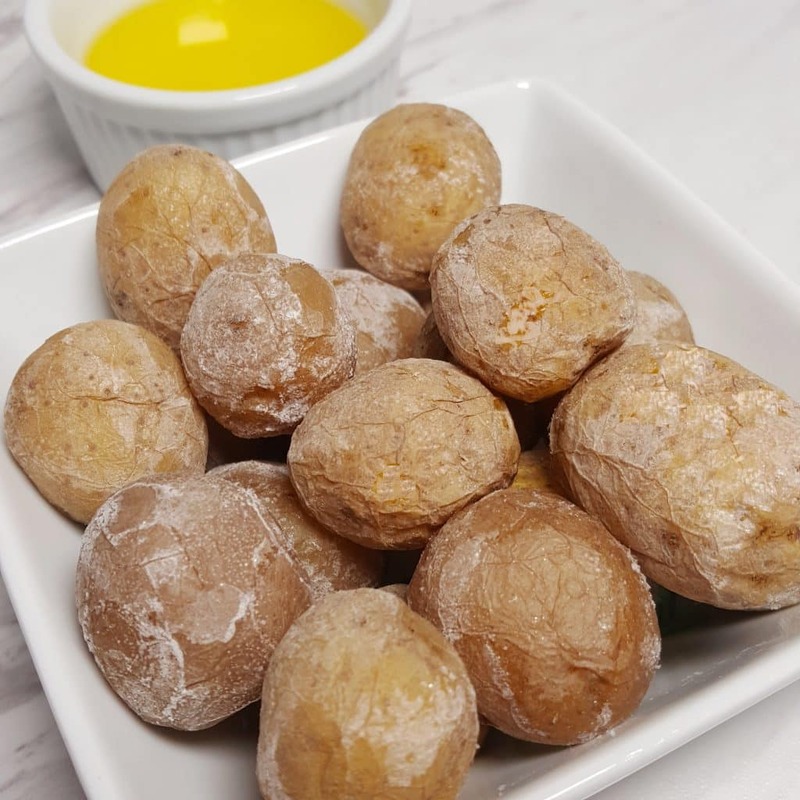 Tips and Tricks to Instant Pot Salt Potatoes. Make sure to use warm water and whisk to thoroughly combine the salt. 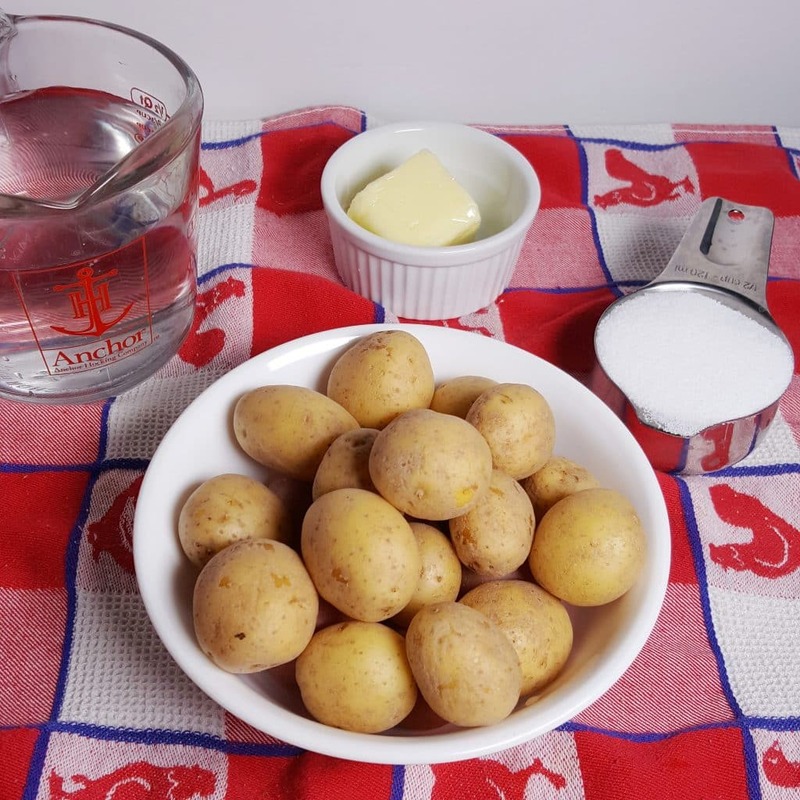 Use a Stainless Steel Colander to drain the salt water from the potatoes to let the salty crust form. Melt a little butter while the potatoes are draining, so the butter is nice and hot. Chives, Scallions, Rosemary, or other herbs you may like, an be used when you melt the Butter. These Instant Pot Salt Potatoes are so good on their own. The Melted Ghee or Butter, make them even better! 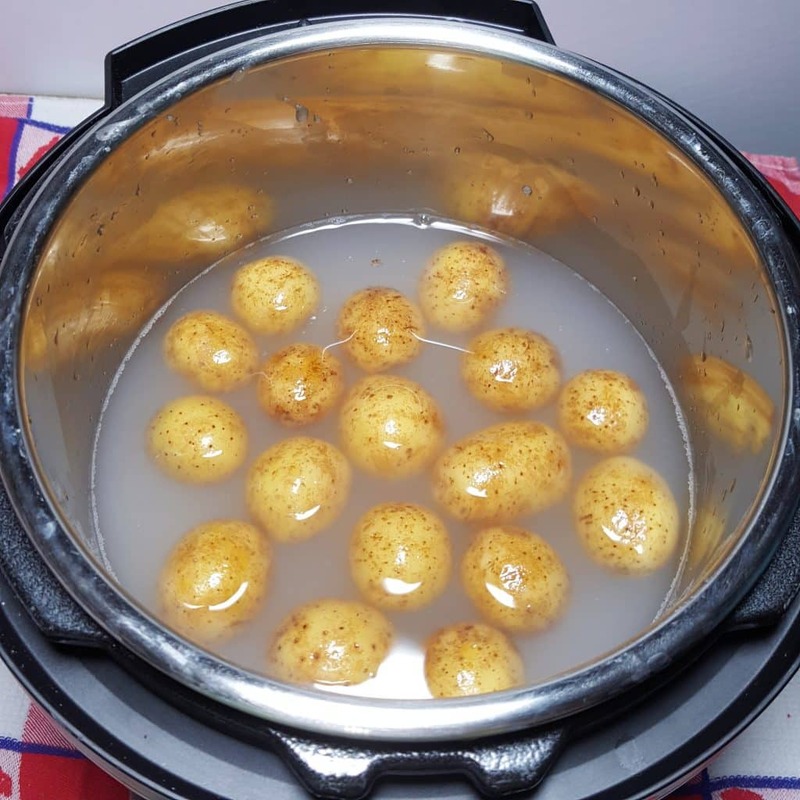 Other Variations of Instant Pot Salt Potatoes. 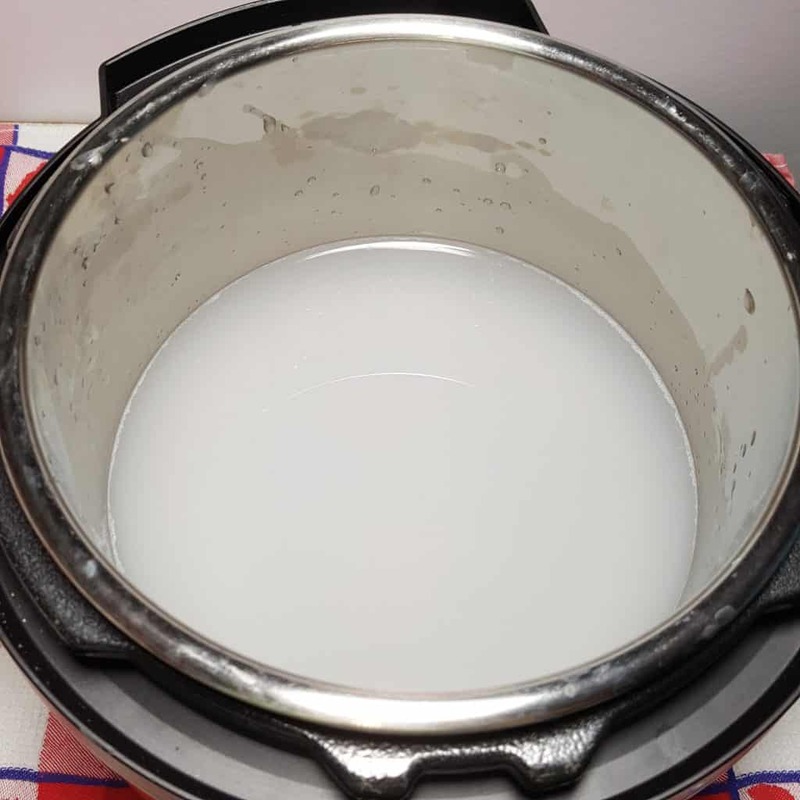 You can add Butter to your Instant Pot, Mealthy MultiPot or Pressure Cooker to melt. Then toss in the Potatoes with some herbs and mix to coat. But, that would be naughty. And I am! For you naughty people, the Tri-Colored Potatoes are so pretty. They taste good too. There is a difference in taste between the colors. If you have any leftovers, cut them in half and put them in your Air Fryer for delicious Air Fryer French Fries. Wash/Scrub Potatoes. 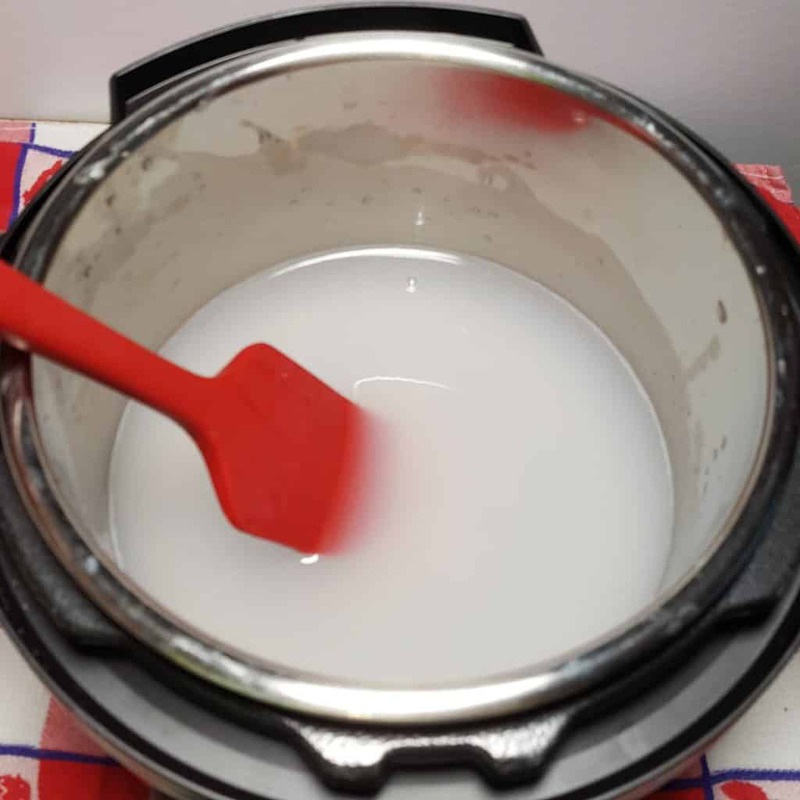 Add Salt and Water to Pressure Cooker cooking pot and Whisk until the Salt has completely dissolved. Lock on Lid and close Pressure Valve. Cook at High Pressure for 2 minutes. When Beep sounds, wait 15 minutes and then release pressure. Strain Potatoes in a colander and let dry for a few minutes. Serve with Melted Ghee or Butter. Mix together Salt and Water and bring to boil. Add Potatoes and cook for 20 minutes, or until soft. Drain and serve. For the Best "Baked" Potatoes, use large Russet Potatoes and cook for 10 minutes. If you want to go rogue, toss in some Chives, Scallions, Rosemary, or other herbs you may like, when you melt the Butter. PIN this Pressure Cooker Syracuse Salt Potatoes! Does the amount of salt pit the stainless steel liner? How long would you cook if you were making “baked” russet potatoes this way? Wow! 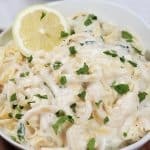 Made this recipe with my new IP tonight and it was a total hit with my family. Thank you so much for sharing. This will be in our regular rotation from now on! 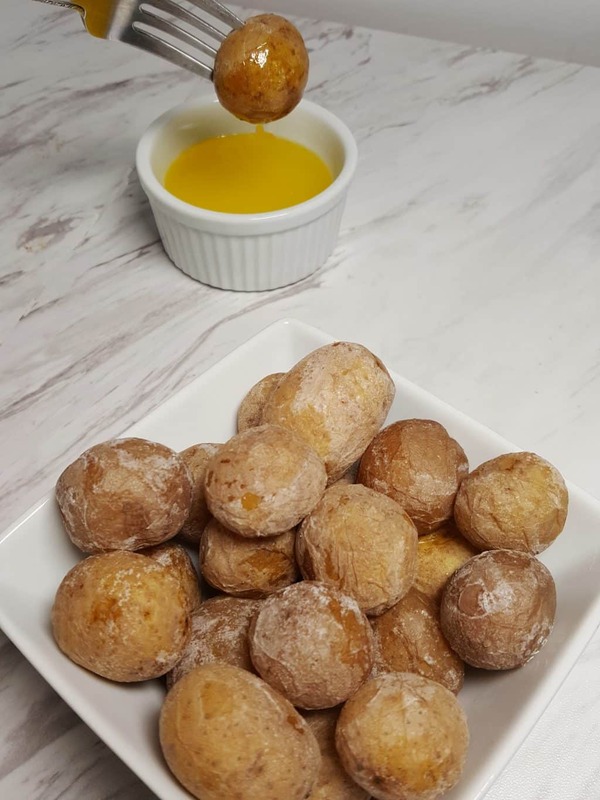 I made these Syracuse salt potatoes today in my mini! They were delicious. How could something so simple be so fantastic! Ice cream! Major yum. Strawberry, Vanilla and Coconut. My favorites. I only have 1.5 lbs. of baby potatoes. same cook time. Does that sound right? Did that work? I have a 1.5 pound bag too. I did nearly that: 1.75 lb potatoes, 4.5 C water, 3/4 C salt (3/4 the recipe as opposed to 1/2), cooked for the same amount of time and they turned out perfectly. I believe she makes note somewhere in the verbiage that as long as you maintain the same ratio of ingredients, you can keep the same cook time with good results. These are so, so good. I have restocked my potatoes so that I can make more. Thanks for posting–I had never heard of them! Meaning Alexander Muss, by any chance? Or just happened to do high school there? I made these last night with potatoes from my CSA, and they were delicious. I roasted them in the oven for a bit after the IP, just to make sure the outsides crisped/dried. I’ve been cooking mostly oil-free, so instead of butter/oil, I made an oil-free green mojo with cilantro, garlic, cumin, sherry vinegar, salt, and sumac. Sliced tomatoes, roasted okra, and potatoes were my amazing meal. I lived in Syracuse and I know salt potatoes. These were the best I ever made. I used the whole 5 lb bag, a little more salt and a little more water. Thanks Jill. I will never make them any other way. 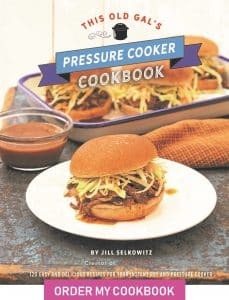 I grew up in central NY and we made these a lot but never in the pressure cooker. Just put a pan on the stove with water, potatoes and the salt….cooked until done. I live in Syracuse, and love our salt potatoes. Here in Syracuse, they sell 5 pound bags of salt potatoes — 4 pounds of potatoes and a 1 pound bag of salt. I’ll have to try the tri-colored potatoes too! Great local potatoes. Much better than what we get in the rest of the country. Hi Jill! Wondering if I could do the salt potatoes on bottom, then pork chops either on a tall rack, or in a pot-in-pot? How long do you think it would take to cook? 15 minutes? Just trying to see if I can make a whole meal altogether! 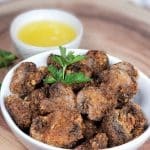 Jill, I made these last night and they were such a success that my guests are buying an Instant Pot! 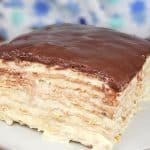 I love your recipes and this is one of the best! Can you make ahead and reheat in oven? I have Natural Applewood smoked sea salt, I will have to try this with it. I love the smokey flavoring it adds to foods. This upstate NYer thanks you for the recipe! We love our salt potatoes here! How about you try some Chicken Riggies next??? My husband just brought home 10 lbs of Salt Potatoes from Syracuse this past weekend. Can’t wait to cook them up! I’ve heard so many good things about this recipe that I decided to try it tonight. It’s in my IP right now and I can’t wait. 🙂 I just have one question: If I make this again within a few days, can I keep the brine and use it a second time? Thanks!! Tried this recipe tonight for family dinner. Everyone loved it. Cut the ingredients in half. Used a 1.5 lb bag of baby potatoes, 1/2 cup of salt and 3 cups of water. Cooked for the same amount of time (2 mins high pressure + 15 mins release). Turned out perfect. Thanks for the great recipe. I’ll definitely make it again. I tried this recipe yesterday for the first time, for our family Sukkot dinner and let me tell you it was the best! the potatoes turned out so soft and yummy, one of the best potatoes recipes. And with the melted butter… serious indulgence. Zero work and 100% success. This recipe will go in the family pantheon. It was, as you said, like the dead sea. It brought back so many great memories of our family camping trips to the dead sea as a kid (well, except for the wet-finger-in-the-eye moment 😉 ) . So thank you for this great recipe. I have 4 colanders… none are stainless. Is it important that the colander be stainless? These are fabulous! The family loves them just as they are, but I just saw a recipe for oven-roasted Salt & Vinegar potatoes and I am intrigued. Do you think I could just substitute vinegar for the salt? 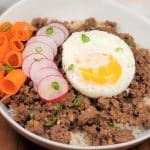 So we love this recipe! But after reading this reply, I decided to try vinegar. I improvised and substituted 1/3 of the water with vinegar. I loved them, but my husband’s response was “interesting!” LOL Since there are only 2 of us, for 1 lb of potatoes I mixed 2 C water with 1/2 C salt, which I dissolved before adding 1 C of vinegar. I used Apple Cider that I had on hand but I do think Malt Vinegar would be better. I really enjoyed them and like the potatoes both ways. Hello, I am hoping to make these potatoes but I do have a question. My Instant Pot is 8 qt and I was wondering if you would recommend adjusting (increasing) the recipe at all to ensure coverage of the potatoes or just keep everything the same? If adjusting the recipe, what would you recommend? Thanks. Do you have any idea how long 6 cups of water will take to come to pressure?? And do you start with hot water? High School in Israel. class of 1983! Or, you can do what I do and buy Hinerwadel’s Salt Potatoes! These are from Hinerwadel’s in North Syracuse on Taft Road. Hinerwadel’s is a clam bake place, which is amazing! These are the best ones you can buy! I grew up on them and still make them when I can get them. I grew up in Syracuse until I moved away at 38. In New York, nearish to Syracuse, you can buy a bag of Syracuse potatoes, small young potatoes and they come with the salt packet . Actually, they didn’t bring a bag of potatoes, but each of the workers would throw them in a put in the morning for lunch. Syracuse had ponds around Onondaga Lake that were naturally salty. They were asking the Erie Canal route. In later years the ponds were poisoned be Cross Hindes dumping chemical crash into the lake. The remaining ponds are now home to geese and ducks year round. If you are in almost any grocery store in Upstate you will find 5lb bags of them under the Hinderwaldel brand. They are a local clam back place that puts on the best spread and these are a staple. These were delicious and I will certainly make again. I used Himalayan salt. I put it in a bowl of water and microwaved it so I could better dissolve the large crystals. Then I put the salt water in the instant pot with the potatoes. Even better, if you mash them up with some butter or margarine and half n half, they make some mean mashed potatoes! Oh my gosh! These were amazing. I had a pound of leftover smallish potatoes and thought I’d try out this recipe. Jill, they were salty, and creamy and full of flavor. And so very easy. These are definitely a keeper! So excited to try this. We used to live in the Canary Islands & loved these potatoes. I’m looking for a mojo recipe now! Thanks for posting. Do you poke holes in the russets like you would making a normal baked potato, or no? Trying this tonight and realized my potatoes aren’t bite size. They are a bit bigger. Should I increase the time? PS I’m pretty sure it’s the IP Paleo site that stole your recipe, not vice versa. Thought you should know. I love your site!! 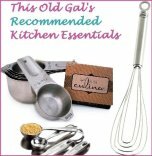 I’ve been making your recipes for a good two years now! Thank you so much for sharing the benefits of your labors with us. In the step by step process, you say to check the recipe card for the salt to water ratio. However, that information is missing from the recipe card. Can you please update with the ratio? These are so freaking good! Thank you for the method. My main way of eating potatoes now! Love these!!! Thanks for the recipe.